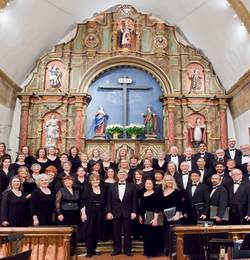 I Cantori di Carmel is a volunteer chorus that seeks excellence in choral performance. Our programs include major choral works as well as lesser-known jewels of the choral repertoire. I Cantori di Carmel (Our Italian name means: The Singers of Carmel) has been bringing choral classics to the Monterey Peninsula since 1981. We perform concerts twice annually, in the spring and fall, at the Carmel Mission Basilica, and other venues throughout the year. We are proud to offer two choral workshops each year which are open to all. Approximately every three years we embark on a European concert tour where we have the opportunity to sing in magnificent cathedrals and many other local venues. Often we coordinate with choirs in our host countries for shared performances. I Cantori di Carmel is listed as an advanced chorus class at Monterey Peninsula College, and each member is required to register as a student. Membership is by audition only. To schedule an audition, call 831-644-8012. Regular attendance at rehearsals is mandatory. Our rehearsals are on Wednesday evenings, and as the concerts approach, also on Monday evenings. Our rehearsal schedule roughly follows the Fall and Spring academic calendar. ​Cyril Deaconoff is a choral and orchestral conductor, composer, and organist originally from Russia and now based in the San Francisco Bay Area. He is a graduate of the Moscow State Tchaikovsky Conservatory and of Indiana University, where he received his doctorate in conducting and also studied composition. Locally, his pieces have been performed by the San Jose Chamber Orchestra, West Bay Opera, and Vallejo Choral Society. He is working with Voices of Silicon Valley, St. Elizabeth Catholic Church in San Francisco, and Immaculate Heart of Mary Catholic Church in Belmont, CA. He is Adjunct Faculty at Monterey Peninsula College and was Conductor of the MPC day-time choir this past year. His opera The Last Tycoon, based on F. Scott Fitzgerald’s unfinished novel, premiered in San Francisco and Palo Alto in 2011 and won The American Prize. Cindy Shen received her bachelor's degree in music composition from the University of California, Santa Barbara. Currently, she is a piano accompanist and private piano teacher based in Pacific Grove, CA. In her spare time, she volunteers at the Monterey Bay Aquarium. ~ To cherish and preserve the heritage of great choral music and to enrich ourselves and the community through live performance. ~ To provide a forum for choral singers to learn and perfect their art with a goal of performing with integrity of technique and expression. ~ To perform a variety of quality music from all style periods. ~ To approach the literature with respect. ~ To perform regularly in live concerts. ~ To maintain an effective organizational structure with skillful, dynamic, inspired leadership. ~ To provide a nurturing, self-disciplined learning environment. ~ To assemble a group of singers capable of growth and accomplishment in vocal technique. ~ To attract and develop choral members who share a commitment to the organizational vision; who are committed to performing with integrity of technique and expression; and who come with a commitment of time, energy and concentration. On September 23, 1981, several members of the Carmel Bach Festival Chorus met to discuss the idea of forming an independent choral group on the Monterey Peninsula. From the beginning, the emphasis was on gathering together quality singers who would be dedicated to the pursuit of excellence in choral performance. The charter group of 27 singers began the search for a Musical Director who would meet their high performance standards. They found Dr. Sal Ferrantelli, new to the Monterey Peninsula and the music department at Monterey Peninsula College. Dr. Ferrantelli's love of choral music, his extensive knowledge of choral literature, his sensitivity to both the technical and emotional dimensions of the music, and his high expectations for artistic mastery were a good match for the group. The singers chose a name, I Cantori di Carmel, and gave their inaugural concert on March 28, 1982. The first program included several 16th and 17th century madrigals and motets and selections from works by Mozart, Mendelssohn, Schubert, Brahms and Fauré. The review of that concert by Scott MacClelland, then music critic for the Monterey Herald, set the tone of critical acclaim for which the group has since been known. He described the performance as "displaying clear articulation, true intonation and, more important, vital spirit, with Ferrantelli leading with vivid attention to shape, phrase and dynamics, and an abiding commitment to his art." In the next few years the members established a formal structure for the organization. A Board of Directors was selected and by-laws were developed, with a mandate for annual election of Board positions by the membership. The group grew in size and was eventually limited to approximately 60 members. The semi-annual concerts have embraced choral/orchestral selections from the Renaissance, baroque, classical, romantic, and contemporary periods. Major works performed have been Mozart's Requiem, Beethoven's Mass in C Major, Haydn's Lord Nelson Mass and Theresa Mass, Handel's Messiah, Brahms's Deutsches Requiem, J. S. Bach's Magnificat, and Verdi's Te Deum. Other works have included Vivaldi's Gloria; J. S. Bach's Cantatas nos. 106 and 150; Handel's Coronation Anthems nos. 2 and 4 and Chandos Anthems; Britten's Te Deum, Jubilate Deo, and A Ceremony of Carols; opera choruses by Verdi; and additional works by Brahms, Bruckner, Rutter, and Mendelssohn. In 1994, I Cantori undertook its first European tour. Since then, it has completed several more tours in Europe. In Spring 2017, after leading the group for 36 years, Sal Ferrantelli retired from MPC. For two semesters beginning with the Fall 2017 season, Tom Lehmkuhl became our conductor. With the beginning of the Fall 2018 semester, I Cantori welcomes Cyril Deaconoff as our new conductor.